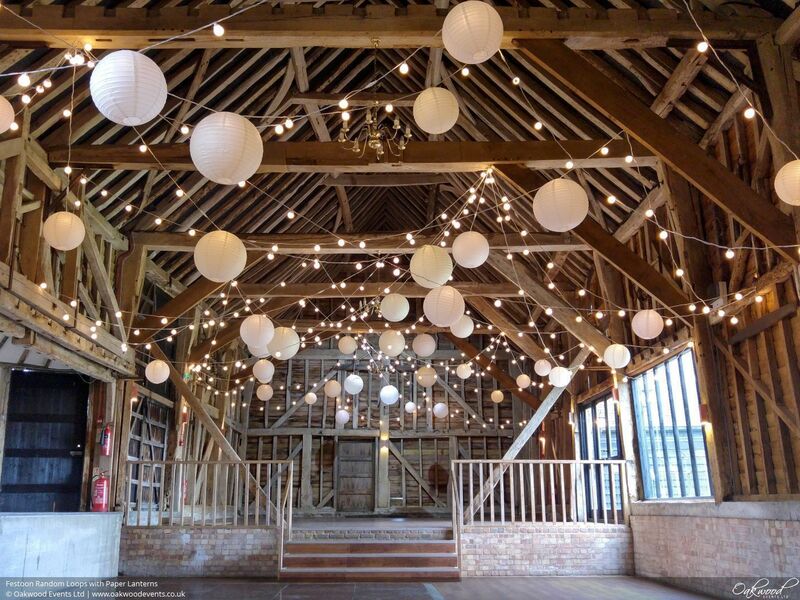 The spec for this large installation was to create an impressive feature which would lower the ceiling height of this enormous barn and provide subtle lighting for the evening wedding reception. We think the result looked superb! The canopy was created by hanging lots of warm white LED festoon lights from the barn's high beams in a series of random loops of varying height and length. Next we added white paper lanterns in mixed sizes to some of the bulbs, spread around the barn. Finally, the festoons were connected to dimmer switches so that the light level could be controlled as needed throughout the wedding. We just wanted to thank you for your services this week. The install on Thursday went so smoothly, Steve was really friendly and explained everything to us and the beautiful lights themselves of course. They looked great and we were so so pleased with them. If you'd like to know more about hiring lighting for a wedding, have a look at our range of services or get in touch with us here.